Crowe definitely has the pulse of Sydney. Yes, Sydney is a global city. International banks and multinational corporations have based their regional headquarters here, establishing the city as a financial hub in Asia Pacific. You could plunk down celebrated Sydney restaurants like Firedoor, Momofuku Seiōbo and Ester in culinary capitals like New York City, and they’d be right at home. On any given day, you can see world-class opera, ballet, classical music and theater at the iconic Sydney Opera House. 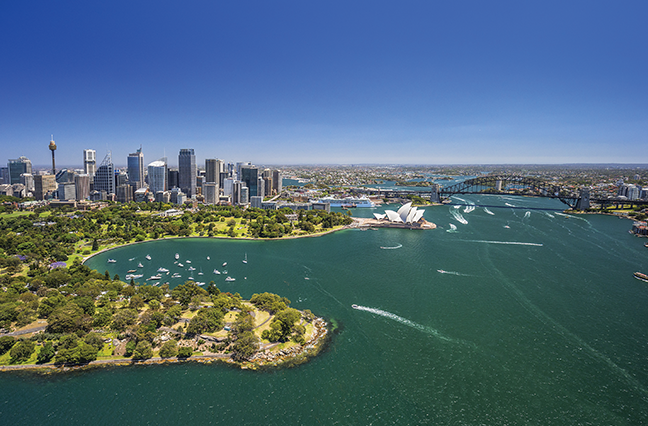 With more than 70 harbor and ocean beaches in the metropolitan area, Sydney feels like a big beach town. If you’re planning a trip to Sydney for business or fun, carve out time to explore the beaches, preferably by foot. From Palm Beach in the north to Cronulla and the Royal National Park in the south, Sydney’s Pacific coastline boasts some of the most beautiful trails you’ll find anywhere. One of the most impressive is the Bondi to Coogee walk on the east coast. Shy of four miles, it can be completed in two hours, but there are plenty of reasons to linger along the way. Begin at the Bondi Icebergs Club, where you can swim laps in the ocean pool or have a cocktail and seafood at the Icebergs Dining Room and Bar on the second floor. It has a bird’s-eye view of the swimmers and a nothing-but-blue-water view of the ocean. Stop to see the aboriginal rock carvings of a shark and whale as you follow the paved path to Mackenzies Point (an ideal whale-watching spot from June to November). Round the headland to reach Tamarama, known locally as “Glamarama” because of the well-to-do locals who frequent the beach. It was once an amusement park with exhibits of sharks, seals and one penguin; today, you can explore its rock pools and watch serious surfers. The next stop is Bronte, another upmarket Sydney neighborhood. Here, you can swim in Bogey Hole, a naturally sheltered rock pool best accessed between high and low tides. There’s a row of very good restaurants behind the park, where you can pick up fish and chips to eat by the beach, grab a flat white to go, sit down for brunch, which the Aussies do very well, or enjoy a glass of wine at an outdoor café. The scenery is quite dramatic as you continue onto a boardwalk, where the next landmark is the historic Waverly Cemetery, the final resting place of famous Australians like poet Henry Lawson. The boardwalk ends at Clovelly, where you can play a game of lawn bowls at the Clovelly Bowling and Recreation Club before the steep climb over to Gordons Bay, a remote cove of fishing boats accessible only by foot or water. The walk around the next headland brings you to Coogee. Offshore, Wedding Cake Island protects the beach from ocean swells, making it the calmest surf along the walk. Reward yourself with a piece of wood-fired pizza or an ice cream at one of the cafés along the promenade.